A certificate awarded by the Florida House of Representatives to Creative Sanford, Inc. on June 23, 2011. This award recognizes the accomplishments, work, and awards received by Creative Sanford. Some of the achievements cited include the Celery Soup production Touch and Go, the 2011 Cultural Preservation Award, and the completion and transcription of over 100 oral histories. The document is signed by Chris Dorworth, the Florida State Representative for District 34. 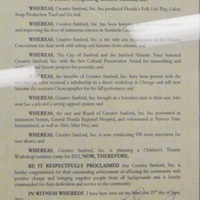 Original 8.5 x 14 inch certificate, June 23, 2011: Florida House of Representatives, Tallahassee, Florida: Creative Sanford, Inc., Historic Sanford Welcome Center, Sanford, Florida. Digital reproduction of original 8.5 x 14 inch certificate, June 23, 2011: Florida House of Representatives, Tallahassee, Florida. Originally created by the Florida House of Representatives and Christ Dorworth. Florida House of Representatives and Chris Dorworth. 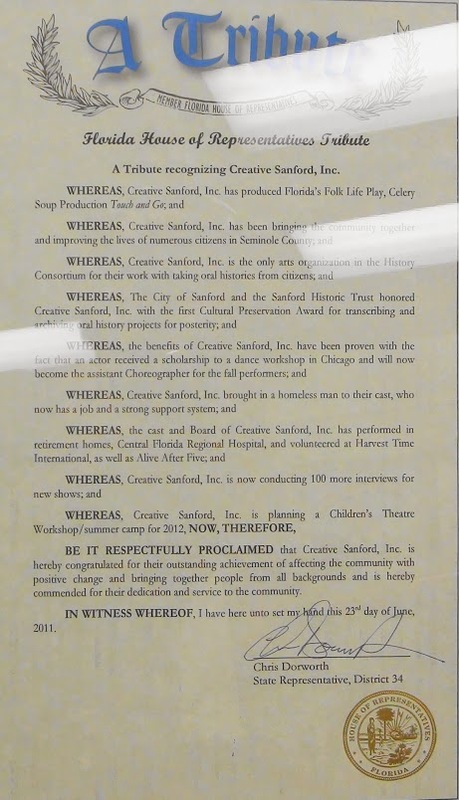 “A Tribute Recognizing Creative Sanford, Inc..” RICHES of Central Florida accessed April 23, 2019, https://richesmi.cah.ucf.edu/omeka/items/show/3049.